How to Assign Ringtone for Contact on iPhone iOS 12? With time we all get bored and tired of listening to that default ringtone play over and over again on our iPhone. Not that I have a problem with iPhone’s ringtone, but what if I tell you there is an easy way to change your iPhone default ringtone? Even more interesting, what if I could also show you how to assign different ringtones for different contacts? I bet I just got your attention! With what I am about to show you, you’re going to find it pretty easy identifying a caller, even without picking up your phone. I’m going to show you how to assign ringtones on iPhone iOS 12 the quick and easy way. Whew! This is going to be really fun. Please don’t get left out. Now, let’s get started. Part 1: How to Change Default Ringtone and Text Tone on iPhone iOS 12? Part 2: How to Get Free iPhone Ringtones for Assigning to Different Contacts? Part 3: How to Assign Ringtone to Contact on iPhone iOS 12? Click on the settings app on your iPhone iOS 12. Locate and click Sounds & Haptics (Sounds for older devices). 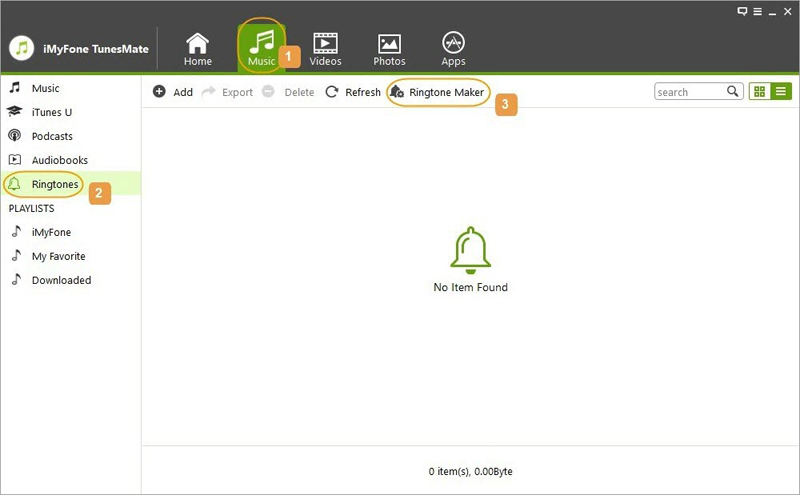 Locate Sounds and Vibration Patterns section, and hit Ringtone to bring out a list of ringtones for you to choose from. Scroll to look for your desired ringtone, select it and you’ll be able to listen to it play. If it sounds cool and you want to use that as your new ringtone, simply hit the back button at the top of the screen labeled Sounds & Haptics to save. Now you have successfully selected a new ringtone for your iPhone iOS 12. Still on the Sounds and Vibration section, just below Ringtone, you’ll see Text Tone. Click on it to change your message tone. This is just getting better and better! I know I said I was going to show you how to assign different ringtones for different contacts. But this right here, this can’t wait! This is really important. 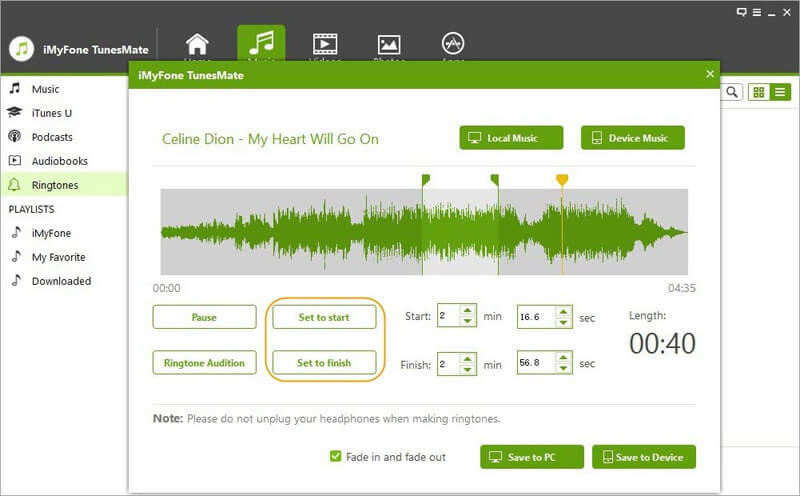 We are about to feed you with undiluted details on how you can easily create iPhones ringtones with a powerful program called iMyFone TunesMate for free. With this software you can easily customize any desired song to iPhone ringtones without having to worry about iTunes restrictions. The perfect iPhone ringtone maker that helps you create iPhone special ringtone for contact and effectively manages all your media files including videos, photos, music, playlists, etc. Allows you to make free ringtones that are compatible with your iPhone, and assign them to different contacts. Seamlessly create free iPhone ringtone from any song of your choosing. 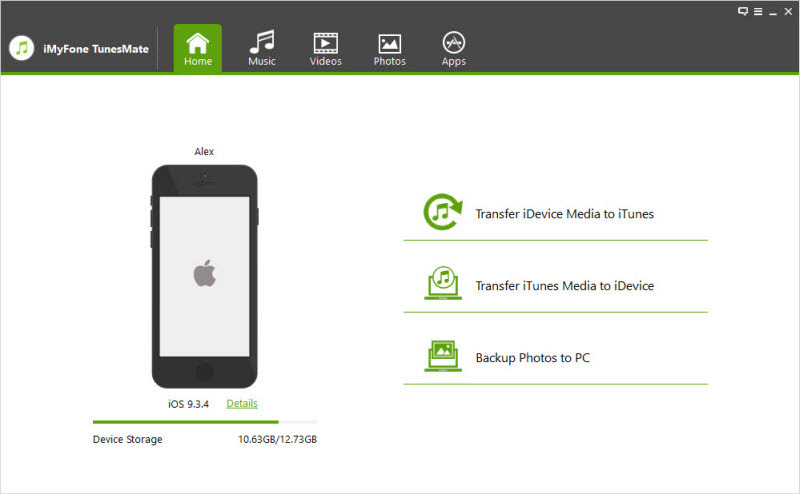 No data loss when you sync media files to iPhone. Easily transfer ringtones from computer to iPhone. Fast and reliable two-way ringtone transfer: gives you unlimited access to transfer ringtones from iPhone to computer or from computer to your iPhone. 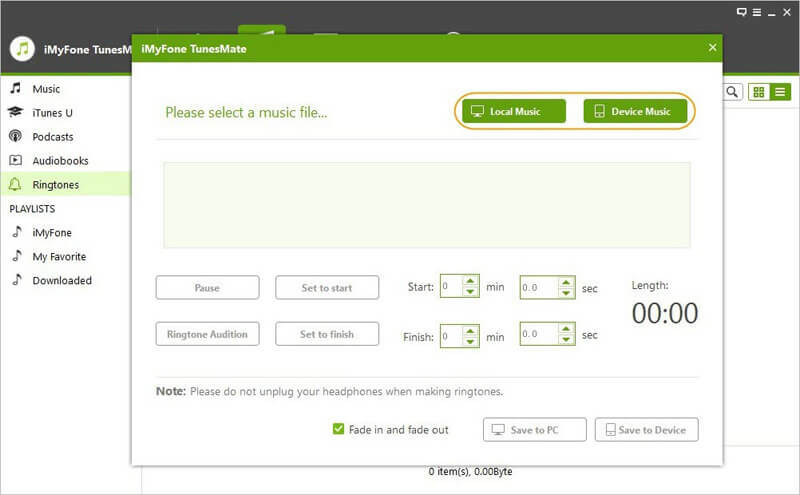 Step 1Click TunesMate software to launch, and connect your iPhone iOS 12 to your computer. Step 2At the top bar of TunesMate interface, tap the Music icon, click Ringtones from the left side bar, and hit Ringtone Maker. Step 3Select Local Music or Device Music to choose the song you want to use as ringtone. Step 4Choose Set to start to set start time, and Set to finish to set stop time of your ringtone. Step 5Tap Ringtone Audition to preview what you just set. Step 6Hit Save to Device to save your new ringtone to your iPhone iOS 12, or Save to PC to save to your computer. Finally, we are here. The moment of truth! The moment I show you how to assign ringtones on iPhone iOS 12. Just follow the steps below, and in a few seconds you’d have successfully assigned different ringtones for different contacts. Click on the Phone app to open. Click on Contacts Menu at the bottom center of the screen. 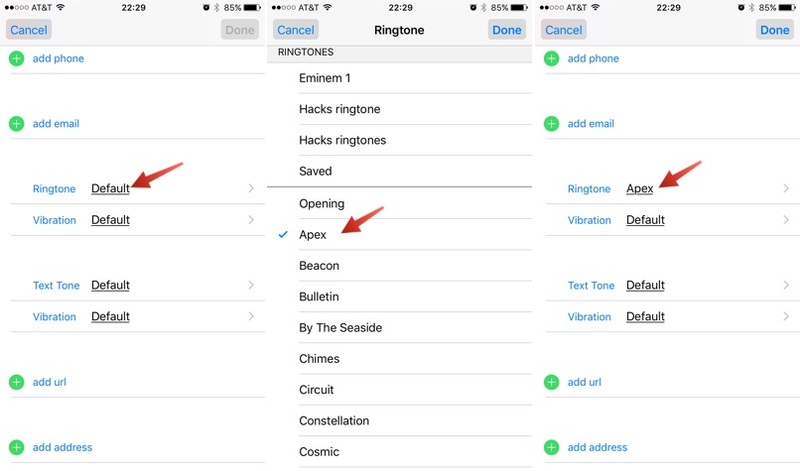 Select the contact you want to assign a custom ringtone. At the top right corner of your screen, click on Edit. This will make the contact info editable. Below email you’ll see the Ringtone option. Select it. 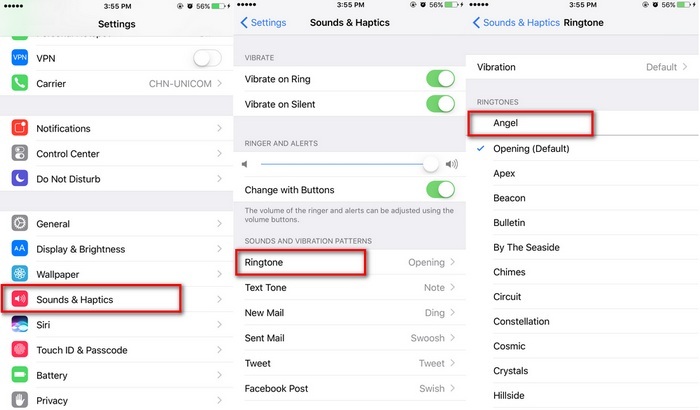 A list of all existing ringtones on your iPhone will be displayed. Ranging from default ringtones, to the custom created ones. From the list, choose the ringtone you want to set. After choosing, tap Done to save and the set ringtone will be played whenever that person calls you. Yep! That’s it. Hope you enjoyed the ride? Now you’ve learnt not only how to change your default iPhone iOS 12 ringtone, but you’ve also learnt how to create a free iPhone ringtone, and how to assign different ringtones for different contacts. Please let us know if it worked for you.